If you plan to start out in charcoal smoking, getting the Weber Smokey Mountain Cooker Smoker, would be the best way to kick things off. PROS: The Weber Smokey Mountain Cooker is a high performing, efficient, easy to use, and affordable. At the price you’ll pay, you’ll get a lot of uses and tons of quality smoked meat and food. Weber also stands by the quality of their product that they are giving it a 10-year limited warranty. The body is simply designed but is made of materials that can endure for a long time. This is definitely one of the best charcoal smokers in the market, and many owners have attested to it. CONS: The only problem about this smoker isn’t about function, but rather, Weber’s own quality assurance team. A lot of this product’s negative reviews share one thing in common: Receiving the wrong charcoal grate size and the difficulty of having it replaced. If you’re ordering from Weber, you’ll have to pray long and hard that you’ll receive the package with the correct grate and parts, otherwise, it’ll take several weeks and heightened stress and anger before you’ll receive the replacement. What are the important aspects of the Weber Smokey Mountain Cooker Smoker 18.5 Inch? Type: This is a charcoal smoker that uses wood chips and coal for fuel. It’s the best friend of every hard-core smoker as it is capable of bringing the best out of grilled meats. If you do it right, you’ll have meat that is seared perfectly on the outside but juicy and tender on the inside. It also has a delicate smoky aroma and flavor that would make anyone forget about his cares. The only downside of using a charcoal smoker is the maintenance and supervised cooking. Whenever you’re smoking, you’ll have to check it every now and then to see if it’s maintaining its temperature as well as refueling. If giving out this extra effort is bothering, you can choose to purchase a gas or electric smoker that would run on its own, with little to no supervision. However, you won’t get the desired smoky flavor anywhere than through a charcoal smoker. This smoker is made of porcelain-enameled steel and measures approximately 21 by 19 by 41 inches. The Lid and bowl constructed of premium-grade U.S. steel coated with porcelain enamel inside and out. 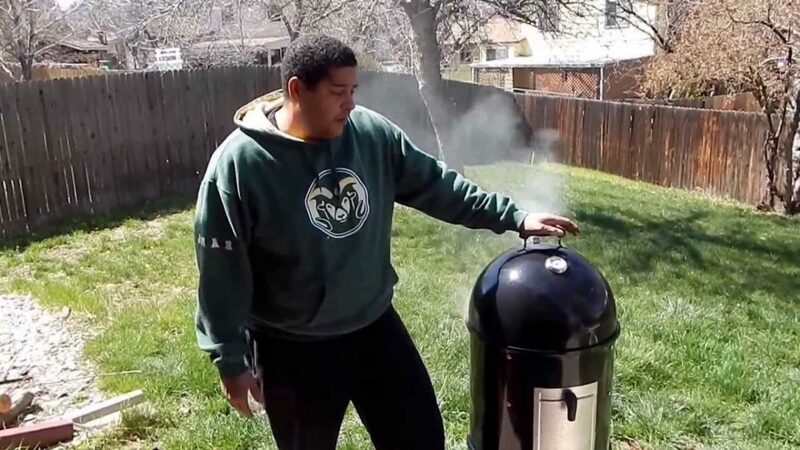 Portability: Weighing only 39 pounds, this smoker is definitely portable. You can bring it anywhere with ease. This is great if you store it indoors or in your garage when not in use and take it out for a weekend of smoking. It also has a heat shield at the bottom to protect your surface from getting hot; making it safe for you to place anywhere you please. The door latch is spring-loaded and features a lever type handle. Capacity: This smoker contains two nickel-plated 18-1/2-inch-wide cooking grates for a total of 481 square inches of cooking space. The two cooking grates are made of heavy-duty plated steel, providing ample room for smoking ribs and a roast at the same time. If you’re planning to smoke lots of ribs, it is recommended to invest in a standing rib rack that allows you to stand up to four slabs at a time, which conserves lots of space. It costs only about $15. Insulation: The Weber Smokey Mountain holds temps well when properly adjusted. Although some owners considered the door as a fairly thin piece of metal, the hugged the unit well and closed tight. No smoke or heat comes out of the smoker. If set right and filled with charcoal, it will run overnight without worries or supervision in just one load. 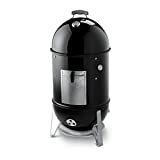 Accessories: This smoker comes with a durable, built-in lid thermometer that allows you to easily monitor your smoker’s temperature as well as a porcelain-enameled water pan, which adds steam to the smoking process so meat stays moist and tender. You can put whatever liquid you want into the pan such as juices, beer, or wine to add more flavor or aroma into your meat. What other things should you know about the Weber Smokey Mountain Cooker Smoker 18.5 Inch? The Weber Smokey Mountain Smoker took about 15 minutes to assemble. You’ll see about three major pieces and small connecting pieces. It comes with a manual for easy assembly and you can check for help online if you experience difficulties. Ensure that after few use that you’ll scrape the grease and gunk on the inside of the smoker, as it tends to overheat when it’s full of unnecessary layer. You don’t need to thoroughly clean the covers, as the meaty smell will add more meaty scent on your next smoke, with the exception of the rim. It should be thoroughly cleaned to ensure an airtight seal. Owners also appreciate the wider door for adding charcoal, pieces of wood, and such. The older model had a smaller door that made it difficult to place wood chunks. The Weber Smokey Mountain Cooker Smoker is definitely one of the best, if not the one on top of the smoker chart. It’s very easy to use, lightweight, and has sturdy materials and grate that will surely last you years of contented smoking. Every single part of this smoker works in harmony with each other, making it a breeze to operate. Unlike other smokers or grills that requires you to be present all the while, this one can operate on its own after you set it up right. The body, albeit thin, is efficient at keeping the heat and smoke intact inside for great cook and flavor.